NCSLA's mission is to provide opportunities for leaders in both formal and informal science education by offering a forum to exchange ideas and information, advancing quality STEM instruction, and influencing education policies and legislation. NCSLA's vision is to engage in authentic networking, celebrate science educators, support emerging science education leaders and advocate innovative practice in North Carolina. Today, science leadership begins in every school and includes lead teachers, department chairs, science coordinators and supervisors, informal educators, university professors, state agency specialists, private science consultants, business and industry. No matter what role you play, NCSLA is your source for information and the place where your voice can be heard in improving the qulaity of science education across North Carolina. For many years science supervisors in North Carolina met informally prior to the North Carolina Science Teacher Association (NCSTA) conference. As science education became increasingly complex and many school systems shifted their science supervisors to other positions, the need for a professional organization became apparent. Thus, in 1989, the North Carolina Science Supervisors Association (NCSSA) was organized as a non-profit group. 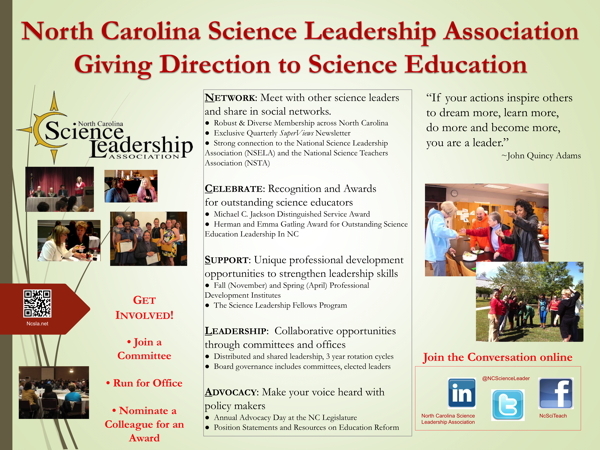 By 1994, the organization had grown to include many types of science leaders other than science supervisors and the organization's name was changed to the North Carolina Science Leadership Association (NCSLA) to reflect that growth. Membership is open to all individuals concerned with leadership in science education.